Have you ever thought about the “creation” of Christ? 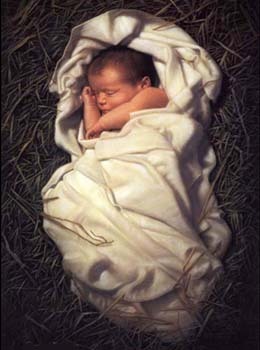 Not as God but as a human, a baby, born in a manger, as the scripture says? Who decided what he would look like, his smile, the color of his eyes, the shape of his tiny nose? Did he and God the Father put their heads together and say, “This is what God Incarnate should look like.” Or did God simply say, “Let me surprise you, Son”? Just some thoughts to ponder as I direct you to a short CHRISTmas devotional called Christ Jesus — a Work of Art. May you be blessed as you consider this most precious gift the world has ever received! This week is CHRISTmas! Our Savior has come!! Hallelujah! As we consider the true meaning of CHRISTmas we light the CHRIST Candle at the center of the Advent Wreath. The One we have waited for has come! We typically reflect on Christ in his years of ministry – as a grown man. The man who walked among his people, healing them, teaching them, forgiving them and loving them. Have you ever stopped to consider Christ as a baby? dependant on others to care for him?